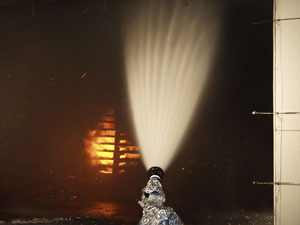 hose streams on a pallet fire. Little, if any, fire suppression research has been conducted on the effectiveness of fire streams from manual hose lines during the past 50 years. Determining the effectiveness of a range of water application methods could have impact on the tactical decisions, equipment choices and water supply requirements that affect fire departments across the country. This project examines a variety of fire fighting hose stream characteristics related to flow, distribution and thermal impact from both solid and fog stream nozzles. 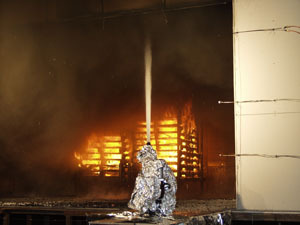 A series of real scale, laboratory based experiments have been started to look specifically at the water discharge and distribution characteristics, the impact of hose streams on a hot gas layer in a compartment, the impact of hose streams on gas flows through multi-compartment structures, and the suppression effectiveness on burning piles of wooden pallets. Based on data collected from these experiments, empirical FDS input sets for a solid stream and a narrow fog will be developed in order to re-create the results of the experiments. The final phase of the project will be to conduct a set of real scale validation fire experiments. Photographs of the burn room doorway on right with PPV and the flames exiting the burn room window during the same experiment on the left. 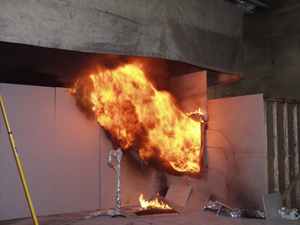 The objective of this research is to improve firefighter safety by enabling a better understanding of structural ventilation techniques, including positive pressure ventilation (PPV) and natural ventilation, and to provide a technical basis for improved training in the effects of ventilation on fire behavior by examining structural fire ventilation using full-scale fire experiments with and without PPV using the NIST Fire Dynamics Simulator (FDS).